Stunning casino with a distinctive style and effervescence that creates an atmosphere perfect for a sophisticated night out. High stakes games options and learners friendly world-class service. After undergoing some changes and renovations, London’s Palm Beach Casino has lived up to its name, offering entertainment and fun reminiscent of the famous Palm Beach in Florida. Formerly known as the Mayfair Hotel, the Palm Beach Casino is an exclusive casino in Mayfair, an area that’s quickly becoming a hotspot for opulent lifestyles in Europe. 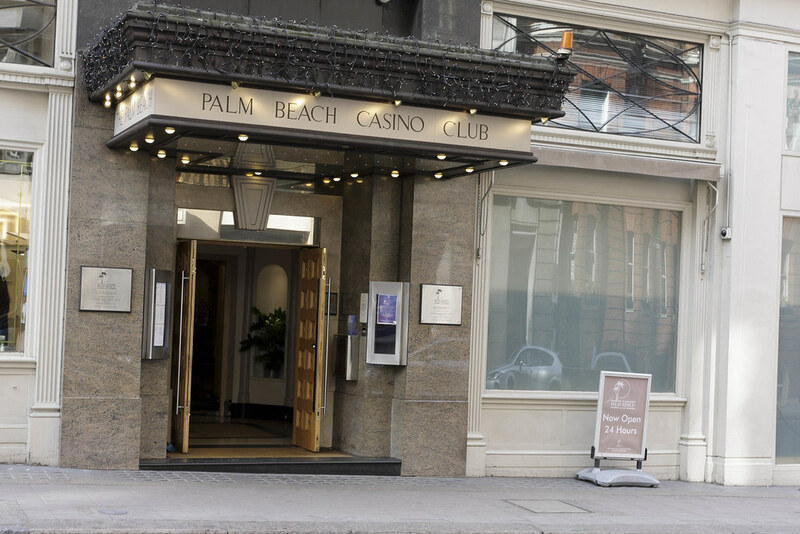 Claiming to be the most exclusive casino in all of London, the Palm Beach Casino promises to allow patrons to experience unrivalled luxury from the moment they enter its art deco doors to the minute they leave for the nearby train station. Named after the famous town of Palm Beach in Florida, one can expect to be treated to endless fun and entertainment when visiting at Mayfair’s Palm Beach Casino. Easily accessible via public transportation and open 24 hours, the casino has sought to provide a wide range of services and facilities to its patrons. Palm Beach has everything a gamer could ask for, with dedicated tables for Blackjack, Baccarat and other card games, as well as both American roulette and electronic roulette. The casino is, however, more known for its poker games. Already having made a name for itself in the poker scene by hosting a World Poker Tour leg last year, Palm Beach continues to build itself up into the poker player’s paradise by hosting Texas Hold ‘Em and Omaha poker games for its patrons throughout the week. What truly sets the Palm Beach Casino apart from other exclusive clubs in London, however, is the fact that they also offer blackjack, baccarat, roulette, and poker lessons to casino rookies upon request. This allows gamers of all skill levels to enjoy the casino’s many features. As with other exclusive casinos, London’s Palm Beach has an in-house restaurant that serves quality dishes throughout the day. The lunch service starts at 11:30am and ends at 7pm, at which point, dinner service begins. The late-night menu is served until 2:30am. The menu has an array of Indian, Middle Eastern, Modern European and specialty cuisine, with prices ranging from £5 to £20. They also have a bar that is decorated in an informal way, allowing patrons to relax and share intimate moments with friends. After 5pm however, the bar is transformed into the lively Bar Bites lounge, complete with a DJ and its own special menu. The casino’s restaurant and bar stocks on some specialty wines, and their resident sommelier is versed when it comes to the best food and wine pairings. Throughout the year, Palm Beach also hosts lively events for its patrons. These include, but are not limited to, cultural nights and live music performances. They’ve also been known to show sporting events on their TV screens for their patrons for free. Because Palm Beach prides itself in creating a sophisticated environment for its patrons, guests of the casino are expected to wear formal attire. Membership with the casino is free, and an existing Loyalty Scheme even ensures that regulars of the casino are rewarded accordingly. With a WorldCard Rewards Card — which can also be used in various other Genting casinos — patrons can earn points for each time they play, dine, or drink at the casino. Members can then use these points to avail of other services in the casino. The only drawback is that you can’t simply walk into the casino and expect to be able to play. The casino requires that guests have been members of the casino for at least 24 hours before they can play at the tables, but registered members can also bring in a maximum of 6 guests per visit.